As many are aware, Standard & Poors publishes earnings estimates on a quarterly basis. This entry was posted in Investor, Stock Market and tagged S&P500, S&P500 Earnings, Stock Market on May 30, 2010 by Ted Kavadas. The US had a massive malinestment (An investment in wrong lines which leads to capital losses. Malinvestment results from the inability of investors to foresee correctly, at the time of investment) in housing induced by affordable housing mandates, easy money from the Fed, and Fannie and Freddie guaranteeing mortgages that they had no business guaranteeing. You cannot get over a debt infused recession with more debt. You have to work off the malinvestment. This is why the Keynesian cure never works. Just look at Greece. But instead of working off the malivestment, we are trying reinflate the housing bubble with more spending. We are trying to reinflate the economic bubble with the stimulus package. 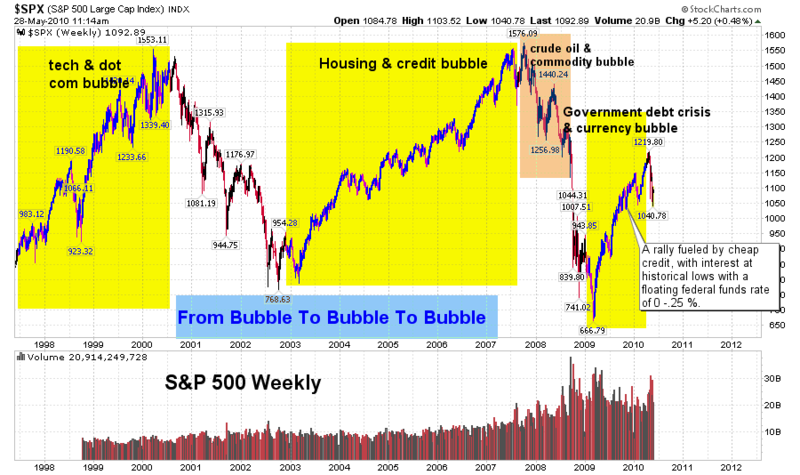 This entry was posted in Bubbles (Asset), Investor and tagged asset bubbles, bubbles on May 28, 2010 by Ted Kavadas. I recently saw an ad for “Bubble Investing” and thought it was notable. It used to be that the mere idea of an asset bubble led to concern. Now, it appears as if asset bubbles are seen by many as more of an opportunity than a threat. Of course, investing in bubbles can be profitable. As I wrote in the December 3, 2009 post, “Investing in bubbles can be extremely profitable on the way up; however, for the “long” investor they can produce huge losses if one doesn’t time the exit appropriately.” History has shown that the (vast) majority of investors don’t time the exit appropriately. While I have extensively written of how problematical the asset bubble situation is today, it should be noted that others have written to the contrary. The April 25 2010 post concerning work by Frederic Mishkin and an April 27 article by James Picerno are two prominent examples. This entry was posted in Bubbles (Asset), Investor and tagged asset bubbles, bubbles on May 27, 2010 by Ted Kavadas. On May 19 The Wall Street Journal had an article about a new housing survey called the MacroMarkets Home Price Expectations Survey. However, if one looks at the detail (pdf), one sees a significant differing of opinions, with the highest cumulative gain (through 2014) expected to be 36.74% and the lowest a loss of 17.99%. This survey should be interesting to watch as it provides a relatively broad view of housing price expectations on a recurring basis. As for the survey results – I find them interesting. The overall consensus view on housing seems to mirror this survey’s average forecasted results – that of mild but steady home price appreciation over the next few years. I’ve written extensively about housing, as it is of the utmost importance to our economic situation. Our national real estate problems are vastly complex and highly problematical. Perhaps my overall view on the situation and the path of housing prices is best summarized by my January 8, 2010 post. 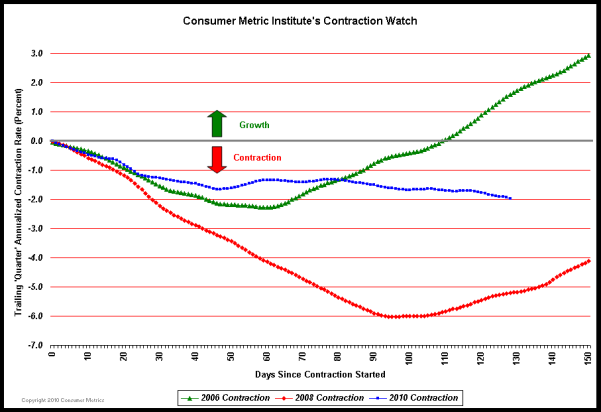 This entry was posted in Real Estate and tagged MacroMarkets, Real Estate, real estate bubble on May 24, 2010 by Ted Kavadas. Over the last few months, four phrases have been used frequently in describing our economic condition. I find these phrases to be inaccurate and misleading. Many people have labeled the economic weakness (ended by the subsequent purported economic recovery) as “the Great Recession.” This appears to be in recognition of a deep recession that in many ways seemed to be second only to The Great Depression as far as severity. I believe the phrase to be inaccurate as my analysis indicates we have yet to experience the full extent of the economic weakness – and as such categorizing weakness to date is premature. Also, I find the term “Great Recession” to be rather glib and flippant, as it minimizes the extent of our economic difficulties. This phrase is heard constantly. It seems as if the more it is said, the more accepted it becomes. I believe that although employment may have been a “lagging indicator” in the past, during our current period of economic weakness it is either a coincident or leading indicator, depending upon the time horizon and other guidelines used. This phrase, and variants, is often heard in relation to the expansion of deficits and national debt. While I don’t believe it is wholly inaccurate, I think it embodies various mistaken beliefs. Among these mistaken beliefs are that we as a country will not face near-term repercussions from our amassing of debts; and that the worst consequence (and only one worthy of mention) of our current economic actions with regard to future generations’ prosperity is our amassing of debt. The broader, and more important question – which is seemingly never mentioned – is whether we are acting as “good stewards” in relation to the economic condition that will be faced by future generations. In essence, is the current generation promoting an economic environment that will bode well for future generations? I will likely discuss this topic in the future. This phrase has been frequently used to describe the sudden, deep decline of the stock market on May 6. I don’t think the phrase is accurate for a number of reasons. Again, the phrase sounds glib and implies that the decline lacked (lasting) significance or happened without significant reason or provocation. There are many other erroneous phrases used frequently to discuss our economic condition. In the future I will highlight others that I believe have outsized significance. This entry was posted in Uncategorized and tagged national debt, Unemployment on May 21, 2010 by Ted Kavadas. Yesterday The Wall Street Journal had a story about Wal-Mart’s results. I’ve commented on this “paycheck to paycheck” issue previously. It is a very unfortunate situation and one that is a testament to the widespread lack of prosperity. While accurate statistics of the “paycheck to paycheck” situation are hard to find, it seems as if it is a widespread condition among many income levels. This entry was posted in Uncategorized and tagged paycheck to paycheck on May 20, 2010 by Ted Kavadas. Of course, there are many different ways to measure volatility. 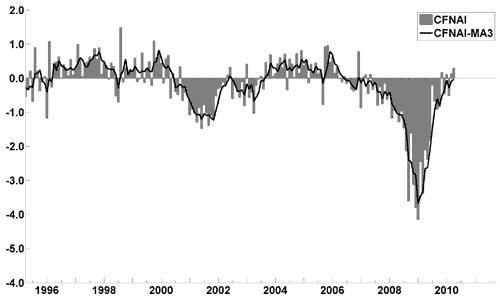 Other measures are showing a significant increase as well. 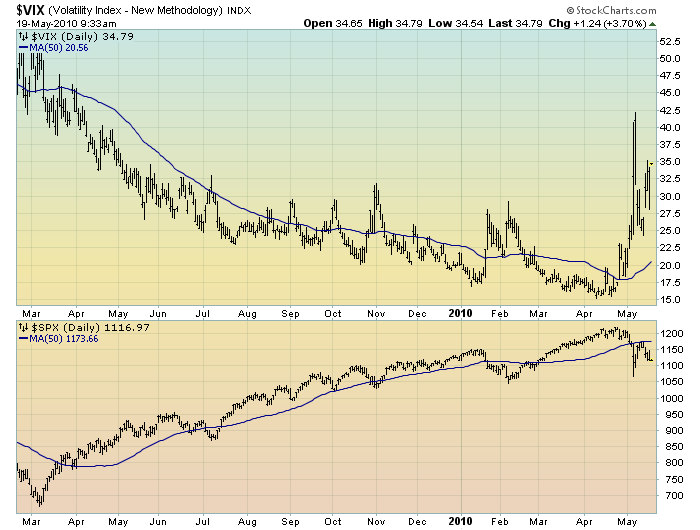 I expect there to be significant, and steadily increasing (relative to the past 15 months) volatility going forward. This will be seen in both up and down price movements. This volatility is being caused by a variety of factors. I believe that we are building to a variety of major market events. I will be elaborating upon this shortly. This entry was posted in Investor and tagged S&P500, Stock Market on May 19, 2010 by Ted Kavadas. The May Wall Street Journal Economic Forecast Survey focuses on the economic problems in Europe and the odds of The Federal Reserve increasing interest rates. Of note, with the exception of the Crude forecast, the above categories have not seen much change in average expectations for up to a year. 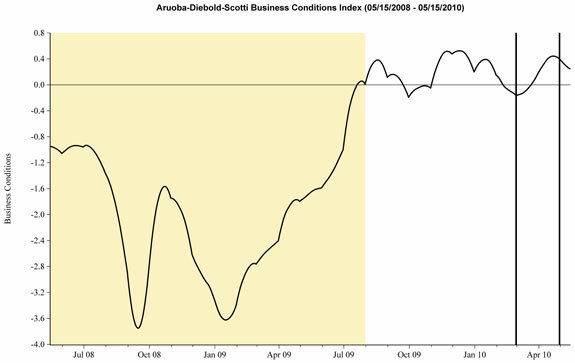 This entry was posted in Economic Forecasts and tagged Economic Forecasts on May 17, 2010 by Ted Kavadas. “The available evidence…casts grave doubt on the possibility of producing any fine adjustments in economic activity by fine adjustments in monetary policy….and much danger that such a policy may make matters worse rather than better…The basic difficulties and limitations of monetary policy apply with equal force to fiscal policy. Political pressures to ‘do something’ …are clearly very strong indeed in the existing state of public attitudes. This entry was posted in Intervention and tagged interventions, Milton Friedman, stimulus on May 16, 2010 by Ted Kavadas.